Seventh grade social studies classes take 1st and 2nd place, during Civics Day at R.I. Statehouse. As citizens in a democracy, we must know how to move toward agreement together. 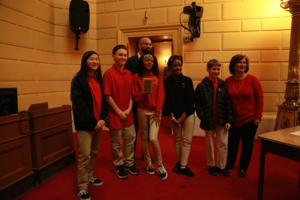 Those were the words of Ashley, who recounted how she and fellow seventh graders worked out opinions and arguments to present action projects on local issues during Civics Day at the Rhode Island Statehouse last December. Community Prep was one of 43 middle and high schools to make “youth-led-change” presentations graded on the criteria of: Grassroots Change, Systemic Impact, Collaboration and Diversity, Action, and Open-Mindedness. Rhode Island is one of only four states to allow a concealed carry permit holder to bring a gun onto the grounds of a K-12 school. 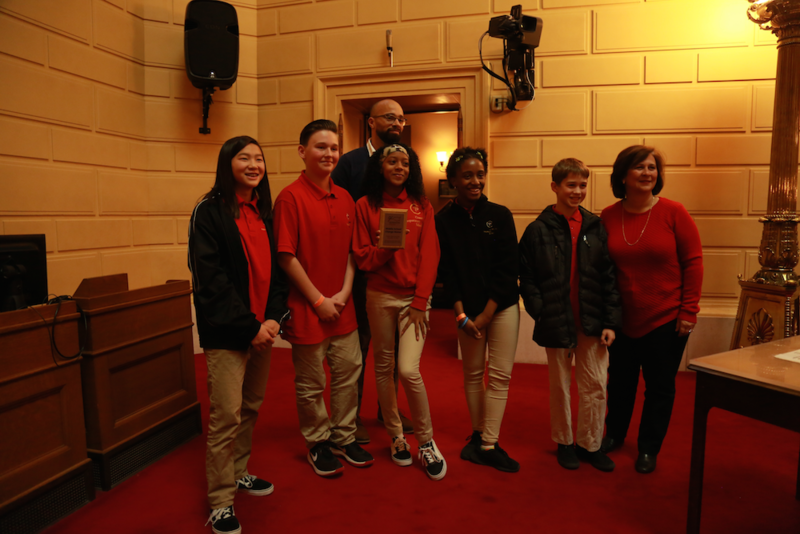 Using a tree—roots-trunk-crown-foliage—to symbolize the systemic nature of gun culture and gun violence, the students argued that except for law enforcement, guns should stay out of local schools. Gun violence affects almost everyone today, said Nate. “A young person who is shot and killed will never go to college, have a wedding, or send their own children to school. What does that say about us as a society?” asked William. For each point introduced by the students, “such as ‘good guy with a gun,’ we debunked it and learned more along the way,” added Ashley. 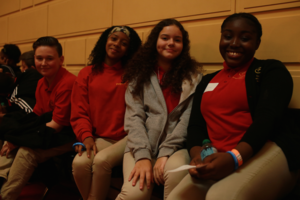 This was the second year that Community Prep’s seventh-grade classes participated in GC’s democracy curriculum, culminating in the Civics Day event. 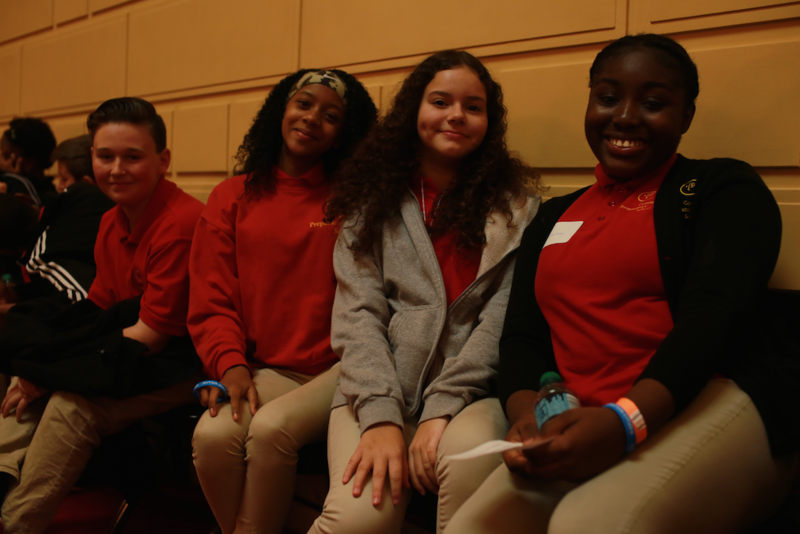 “Through the civics curriculum, students learn about democratic institutions and roles, responsibilities and opportunities in their communities,” said Miriam Hwang-Carlos, the GC program associate who worked with the seventh graders. Rhode Island does not require its schools to offer civics or government courses, and it does not train teachers in civics. Cauley Greene, who teaches English and Social Studies at Community Prep, used the GC curriculum in each of the school’s seventh-grade classes. 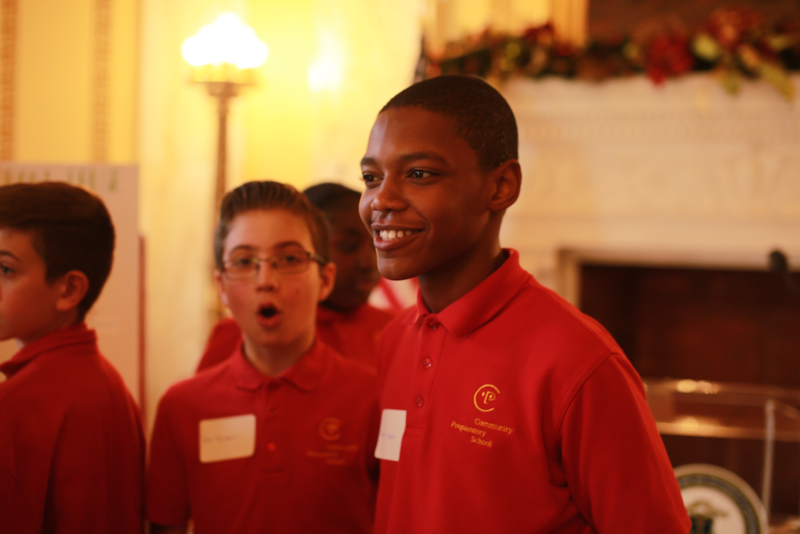 “I think it’s important to exercise our civic muscles as much as we can and as early as we can, and a program like this might be a critical piece of a young citizen’s understanding of their roles and responsibility in our democracy,” he said. While one class focused on gun permits and school safety, the other chose to examine plastic-bag pollution, eventually calling for a ban on single-use bags. Plastic pollution was easier for us to focus on, said Ari. “We see how plastic hurts the environment.” Ian agreed. “Just look at the YouTube video of the sea turtle with a plastic star stuck up its nostril,” he said. 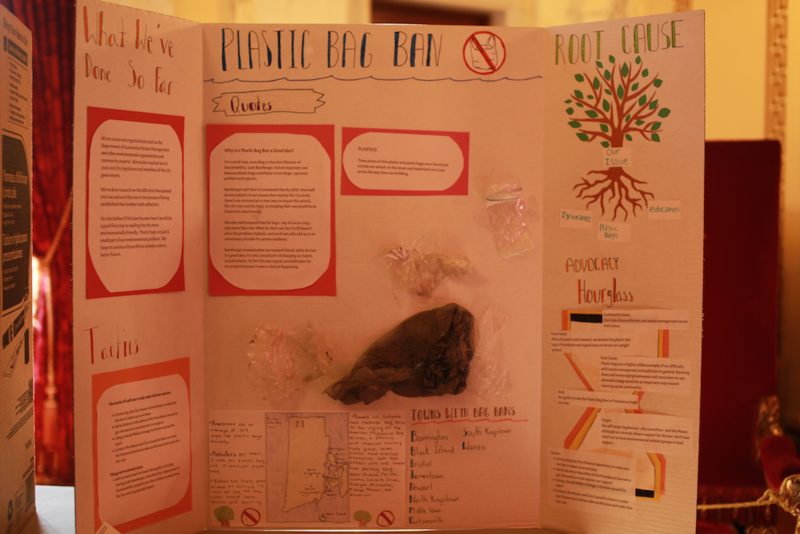 The plastic-bag pollution action project took second place behind the firearms presentation among middle schools participating in Civics Day. Students in each Community Prep class chose smaller groups to move the process along, including group leaders. 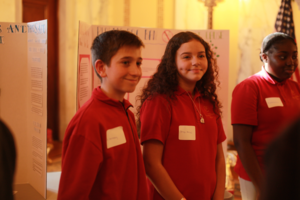 Among its actions, a team compiled research, interviewed community members, communicated with legislators, prepared standalone posters, and verbally explained their projects to the Civics Day audience of legislators, community leaders, volunteers, peers and others.